The holidays are better with bacon, right? 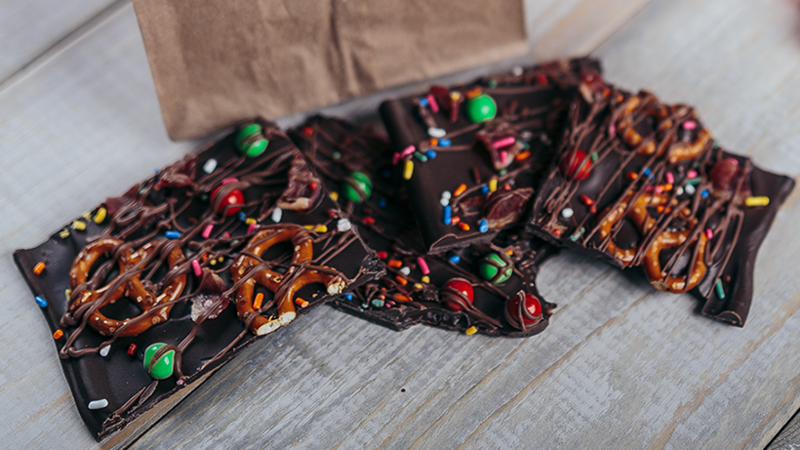 Whip up our easy Chocolate Bacon Bark using Gwaltney Bacon, and gift to friends and family. Line a baking sheet with parchment paper and melt chocolate candy in the microwave in 30-second increments. Stirring after each increment. Pour the chocolate into the pan and spread evenly. Top with ingredients and freeze until hardened (about 12 hours). Cut a piece of card stock or construction paper the width of the paper bag. Cut the length of the card stock or construction paper into a V shape so that the point comes about 3/4 down the bag. Decorate the paper with sayings or drawings. Stuff the bag with goodies. 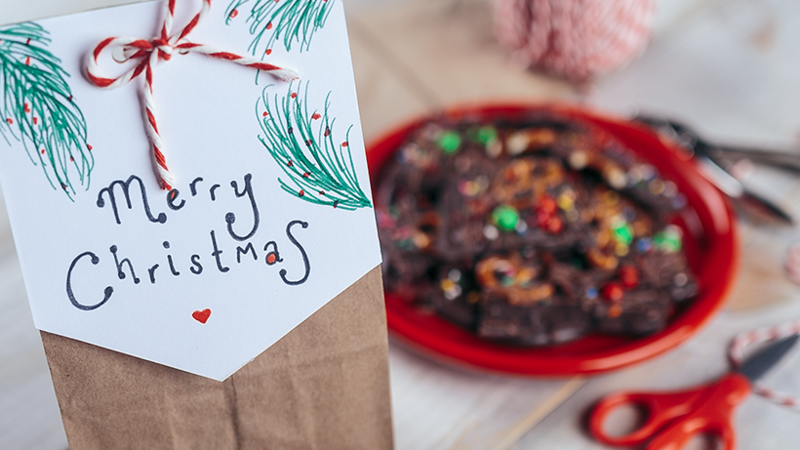 Hold the decorated paper to the top of the lunch bag (V shape pointed down) and punch two centered holes about a 1/2 inch from the top and a 1/2 inch away from each other. Cut a piece of ribbon about 6 inches long. With the holes aligned and the decorated paper facing you, insert each side of the ribbon from the back side of the bag and tie a loose enough knot or bow so that it doesn’t rip the paper. The bow and decorated paper will be facing the same side.